You want weirdness? I'll give you weirdness. Society is absolutely fucked up. Directed by Brian Yuzna, whose other collaborations with Stuart Gordon has given us many a classic gorefests. This time he's on his own however, and you get a feeling that he was the one responsible for all the twisted ideas in classics such as Re-Animator and From Beyond. There is probably a story in Society, but that's totally irrelevant. 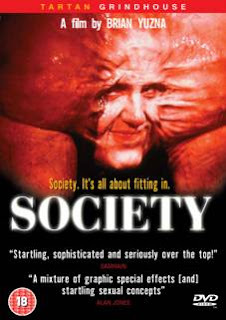 If you like to see just how much the human body can be morphed and deformed, then Society is the film for you.